Despite what the weatherman may tell you, this is a glorious time of year. There’s always a great plethora of albums released in the April/May/June window, ideally pitched so that an artist/group can run into festival season on the back of new material. It’s similar to the gloriousness of October/November for gig-going as everyone and their nan seem to have nothing better to do than tour their socks off. It’s been hard to keep up recently with all the great releases, and harder still to find time to write anything. But we must start somewhere, and this is the record that has stuck out most for me in this barrage of new music. First off, let me get my Gaz Coombes cards on the table. His former band, Supergrass, are one of Oxford’s greatest bands. In fact, Gaz et al grew up in Wheatley, an Oxfordshire village where I spent plenty of my formative years. Gaz was often spotted around the village, and I’m pretty sure his brother may have once worked at Oxford Welcome Break’s KFC (where I also worked). Either that, or Gaz was moonlighting due to his untold love of Kentucky Fried Chicken and wanted easy access. There’s something acutely inspirational about having such talented, creative people living in the same obscure geographical location, so I’ve always been proud to reference this point. Supergrass parted ways after six albums, and Here Come The Bombs is the debut solo album from Gaz Coombes, formerly the lead vocalist and guitarist of Supergrass. The biggest question on approaching the first listen of the album was just how different from the Supergrass sound would it be. The answer is, it’s very much its own beast, and this is a glorious thing. ‘Hot Fruit’ could easily nestle into the Supergrass back catalogue without too much fuss, with its energetic, hook-laden nature; but an electro edge plays around in the back of the track, giving a taste of something that is expanded upon further on. Tracks like ‘Whore’ and ‘Sub Divider’ expand upon this thought. Guitars still play an important role, particularly in the closing of the tracks, but the journey to this point is often aided and abetted by the sound of keys and percussion. Coombes has been creating great pop and rock songs for 20+ years, so it’s no surprise to find that the album just grows as it progresses. A track like ‘Simulator’ has such a simple song structure, but Coombes knows how to make it work. It chugs along in the verses, before erupting in the chorus’ with everything combining together. Coombes voice has always been something to admire, it magnificently binds together everything else surrounding it. 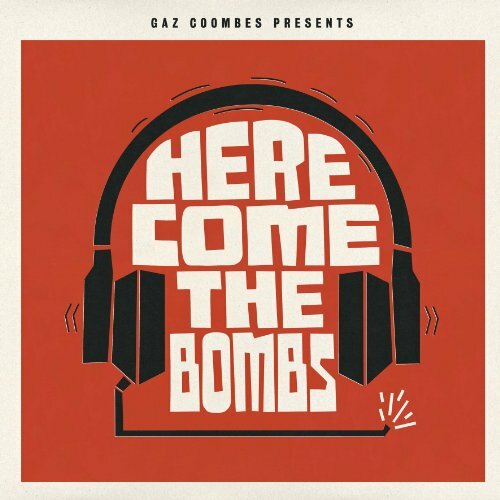 Here Come The Bombs is littered with subtle variety that makes it such an addictive listen which is why I seem to find myself continually coming back to it. Towards the end of the record, ‘Break The Silence’ is Coombes attempt at a euphoric sing along moment: “Break the silence/come on/let it go.” It’s not the most beautiful set of lyrics written down, but it just sounds fantastic. Thus rendering the point of all of what I’ve just written pretty pointless, lest to say, this album is well worth 40 minutes of your time. Or some of your hard-earned cash. And the live show should be pretty tasty too. Roll on October/November.